Capt. 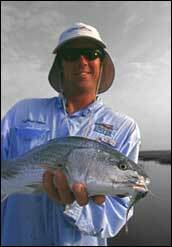 Stuart Caulder is a native fishing guide based in beautiful Wrightsville Beach and Wilmington, NC area. He also trailers his boat up the East Coast for action packed fishing of Albacore at Cape Lookout and the New River for Speckled Trout. Stuart has been fishing these waters since he was 6, and now shares his passion for the fish that dwell here with his customers. Experience Capt. Stuart Caulder’s passion for fishing as he guides you to some of the best fishing on the East Coast. 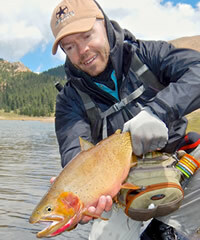 Jeff Currier resides in Victor, Idaho where he bases his globe-trotting career in fly fishing. Jeff is a fly fishing lecturer and well known fish artist. He has taught the skills of fly fishing, guided fly fishers throughout Wyoming and Yellowstone National Park and escorted fly fishers on six continents. Jeff is best known for his love to seek out exotic fish species and face the challenges of catching them. He has presently fished in sixty countries and caught over 375 species on the fly! Jeff’s articles, photographs and artwork have graced the pages of magazines, catalogs, brochures and books. He is the acclaimed author of Currier’s Quick and Easy Guide to Saltwater Fly Fishing and Currier’s Quick and Easy Guide to Warmwater Fly Fishing guide books. Jeff is also a well sought after expert for television, radio and numerous fly fishing films. Jeff brings a sense of humor, enthusiasm, approachability and more than forty years of fly fishing wherever he goes. You can follow Jeff’s fly fishing adventures, exploits, tips, advice, photography and story-telling on his expanding blog and informative web site. 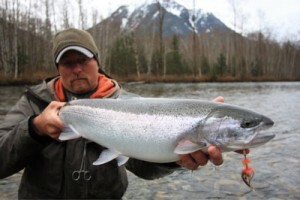 Scott Howell lives and breathes steelhead. Born and raised in Southern Oregon, his father, an avid steelheader and cane rod builder, passed on a love of the Rogue and Umpqua systems that carried over to rivers worldwide. In his late teens, Scott began guiding the Rogue, which ultimately opened the doors for guiding and fishing opportunities few experience. From Northern California, throughout British Columbia, Southwestern Alaska, the Aleutian Peninsula, Kamchatka, Russia, and virtually any river that steelhead ascend, Scott has pioneered destinations, managed lodges or fished there. Today, with two decades of guiding experience to draw from, Scott spends 300 days annually following the flow of the seasons and guiding several of Oregon’s rivers during prime time. A perfectionist, he continually refines technique and tackle to maximize the potential out of every situation. However, Scott understands that ultimately, nothing happens without the fish. Therefore, he takes a hands-on approach to inform anglers about issues concerning the fisheries of Southern Oregon. He regularly updates his site with current information and urges everyone with a shared passion to serve as a voice for the conservation of wild steelhead. Novice and experienced alike, single hand or spey, a day on the water with Scott makes any angler a better steelheader. Born and raised in Denmark, Europe, Jakob Lund spent his early fly fishing years pursuing sea-run brown trout and northern pike. In the late ’80’s he traveled west to the United States (location Oregon) as an exchange student and never left. Jakob quickly learned of Oregon’s north coast river systems, the Deschutes River, and 25 years later, considers those among his home waters. “The Viking” has guide experience in Oregon, Alaska and Kamchatka. With Jakob’s fly fishing retail background, world travel and guide experience, his overall knowledge of fly fishing as a whole is greatly well rounded. 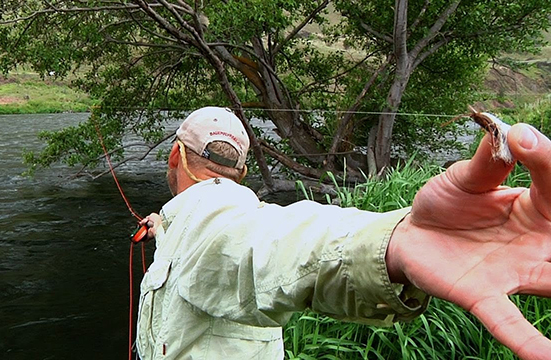 Jakob has appeared in several fly fishing films always fishing with Bauer reels for good reasons. Many of the places seen in these films are shot in waters Jakob calls home. With over a decade of experience fishing, testing and selling out Bauer reels, he knows our product as well as the rivers he fishes like the back of his hand. Landon’s angling success is fueled by an addiction to pursuing large trout with small flies and lightweight fly-fishing equipment – it is this obsession that makes him a perfect match for Bauer. He enthusiastically teaches and demonstrates his techniques and on-river knowledge to fellow anglers and has developed innovative strategies for sighting, hooking, and landing selective trout that he has shares in four instructional books as well as two DVDs. In addition to teaching through guided trips, fly-fishing classes, presentations, and demonstrations, he is also a contributing writer for Fly Fisherman and High Country Angler magazines. Landon has been guiding full time on the South Platte River for the last 19 years, as well as one full season on the Nak Nek River in AK. When not on the river or traveling you’ll find him home with his family in Florissant, Colorado. Nothing puts a smile on Marlon Rampy’s face like the trophy, redband rainbows and wild steelhead of Southern Oregon. Consequently, he calls the banks of the Williamson River home each summer, and heads West to winter in steelhead paradise. So whether it is long leaders and spring creeks, sight casting on stillwaters, or steelhead on the swing, Marlon’s got it dialed.